The following excerpt is from Shanti Urreta’s book, Dear World, See What I See: My Vegan Path. 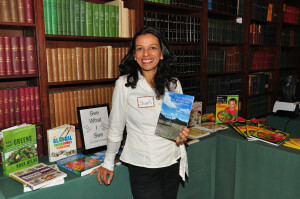 The book is a series of letters written from the author to the world, through which she shares the lessons she learned on her path to veganism. For a limited time, the book can be ordered for under $5 here on our site by entering the word “WORLD” as the discount code when you check out. As I continued to learn about my diet and healthy eating, I read Diet for a New America by John Robbins, and I knew I would never ever eat meat or dairy products ever again. Not because of my health, but because of the animals that I was eating. The author talked about the animals that I had been calling food like they were real and had feelings and personalities. I had not seen that before. It took me three months to read that book. I could only absorb a little bit at a time, cry, and then put it away for a while. My husband kept asking me why I read it if it made me so upset. Time and time again, I said that I had to. I just knew that I had to continue. Little did I realize that by reading and learning about the animals, I was gaining strength. Scenes in the Earthlings documentary still haunt me. Any time I see someone wearing fur, I immediately think of the scenes in that film—scenes of pain, brutality, and death. They are forever etched in my brain. And when I see someone eating a hamburger, I do not see food. I see pain. I see terror. I want you to see what I see. Not because I want you to experience the pain that I feel, but because I want you to see the things that we, as a society, do. And perhaps you will care about it enough to make a difference. And if you think that one person can’t make a difference, that your choices are too small to make a difference, try sleeping with a mosquito in your room. That little mosquito would surely make your night difficult! No one is too small to make a difference. We have to see the connection and we have to care. We have to see what we, as a society, do to the living beings on Earth, because then, as a society, we can choose compassion. And if we are open to understanding the karmic connection, we can choose to not live with all the violence, depression, and devastation in our home, planet Earth. I continued to gain strength by watching DVDs like Earthlings and other videos showing animal torture. I became angry. It strengthened me. I became obsessed with wanting to do something. I knew someone had to help. I felt that I had to. It was a responsibility that I had been given. I was confused as to why people were not inspired by the words, “thou shalt not kill,” and why they did not apply it to all beings. I could not understand how people could commit such horrible acts to animals. And horrible, unimaginable things are happening. The horror continues to drive me. In writing this book, I have chosen not to be descriptive about the abuse. Too many of you would put the book down and not continue reading. I want you to keep reading. I started to live my life doing the least amount of harm possible to any animal. I read labels to make sure they did not contain any animal products. I looked online to make sure the products that I used were not tested on animals. I could not deal with the atrocious ways we scientifically experiment on them. I looked at clothing labels to make sure they did not have wool or silk or animal fur. The humane ways we would like to envision fur and wool being taken from the animals simply is not reality. The leather industry is quite a cruel one also. Try Googling where we get our leather from in India. That is a sad story. Americans’ image of India is that they are kind and compassionate toward cows because the cows are sacred. Not so. Find out where leather comes from. Very sad. My leather sneakers were the last animal-derived product that I gave up. In meditation class one day, the teacher asked us to take energy and push it out of our bodies, but the energy got stuck in my feet. I knew what that meant. After class, I went straight to Target and bought a new pair of sneakers—man-made. I continued to watch videos from the national nonprofit organization Mercy For Animals—videos taken by undercover investigators in concentrated animal feeding operations (CAFOs). I guess these are what can be called the “new version” of Old MacDonald’s farm—buildings where our animals are being raised to be slaughtered. The videos’ contents were not nice. They were horrendous. They were cruel and inhumane and they left me crying for days. And I had to share this information with everyone. Once again I wanted to stand on the mountaintops and shout to the world. Yes, I wanted them to change, but more than that, I wanted them to see. Because once they saw, they would want to change for themselves. Or so I thought. It was happening all over again! People did not want to hear about health, and now they didn’t want to hear about the animals. And then the comments and jokes would start: “You know the definition of a vegetarian? Lousy hunter.” Ha, ha, ha. And they would laugh. And I would hurt. 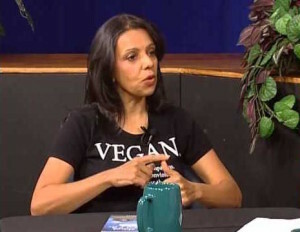 At a Toastmasters meeting, after one of my vegan speeches, another member came up to me and said, “I also support veganism. I am a member of PETA—people who eat tasty animals.” And I had to act as if that did not hurt. I had to hold my tongue. I wanted to take him by the shoulders and shake him and say, “Don’t you see the cruelty that happens so you can have your tasty animals?” But I did not say anything. I tried very hard not to offend people. It hurt me when people did not care and then, on top of it, made jokes. I tried very hard not to be an “angry vegan.” It would not have helped. I bought multiple copies of videos and offered them to many people. I wanted everyone to see them. I wanted everyone to know what was happening. I thought they would care like I did. But they did not. Many people would not even watch the videos. They said it was too painful to see such things; they did not want to get upset. I did not understand why they did not see the connection—that they were asking someone to kill for them so that they could eat, that the animals suffering in the videos were suffering because of them. But I stayed quiet. I was trying very hard not to offend people. And I definitely have no intention of offending anyone as I write this. Some people would watch the videos, but decide a vegan lifestyle was too difficult. I could not understand how seeing this suffering did not convince people to change their eating habits. People had lots of reasons for why they chose to argue against the vegan point of view. “We were meant to be meat eaters.” “We have canine teeth.” “I eat venison; it is so much healthier than other meat.” “I need my protein.” “I don’t feel good when I don’t eat meat.” “We are on top of the food chain, and that is just the way it was meant to be!” “God meant for it to be this way. He gave us animals to eat!” I hated when they pulled the “God card.” I was frustrated. I did not know how to speak to people so that they would understand, and so I got quiet. I did not get quiet in my head, though. I was angry and frustrated and I said an awful lot, but it stayed in my head. I did not want to offend. I did not want to give people a reason to hate me just because of what I stood for. One person questioned, “Why are animals here if they are not here for our food?” I hope she reads this book. Or they would say, “Everything in moderation.” And my smart aleck self definitely would say, “Everything? Even crack?” You cannot give out pain in moderation. You can either allow violence or not. Because I was offending people, I had learned to just respond in my head. They did not want anything to do with me. It was too difficult for them. And you know, I really did understand the fact that it was our culture, that it was the way we were brought up. It was tradition. I really did understand that. That is the way I was raised, too. Communication just didn’t seem to be working with the people in my circle. It was at this time when people really stopped talking to me. I was upsetting many, many people by trying to tell them about the horrendous things that were happening to animals. They simply did not want to hear about it. They wanted to eat their meat and did not want to hear about the reality of the situation. My husband claimed that I “preached.” I just wanted people to see what was happening. What I was learning was not a religion. It was the reality of pain. It was the reality of torture. It was the reality that our actions were causing this. Religion? Religion gives us reasons to love, not torture and kill. I cared. I cared to tears. Many, many tears. I had joined Toastmasters, my public-speaking support group, to learn communication and leadership skills. I needed to learn how to get this message out so people would understand without feeling offended. People needed to hear and understand veganism. I was now a vegan. I now chose to live my life doing the least amount of harm possible to any animal, and I wanted others to choose it also. It was then that I saw another gift. I was given the gift of veganism—of consciousness, of being mindful of the connection between the suffering involved in raising animals for food and pleasure, and the creation of a peaceful and compassionate world. It is all about karma.